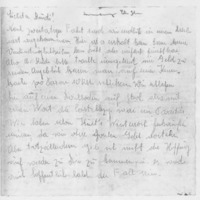 Charlotte Schönfeld, “Letter by Charlotte Schönfeld from Opole to her boyfriend Rudi in Vienna,” EHRI Documents, accessed April 18, 2019, https://visualisations.ehri-project.eu/items/show/137. The European Holocaust Research Infrastructure project (EHRI) aims to provide online access to information about dispersed sources relating to the Holocaust and make these documents and resources more accessible. EHRI is funded by the European Commission under the FP7 and Horizon 2020 programmes.